You can work hard on writing the play, assemble the best cast possible, put together the show of which you've always dreamed, but if you can't get people in the door to see the show, well, that's a problem. 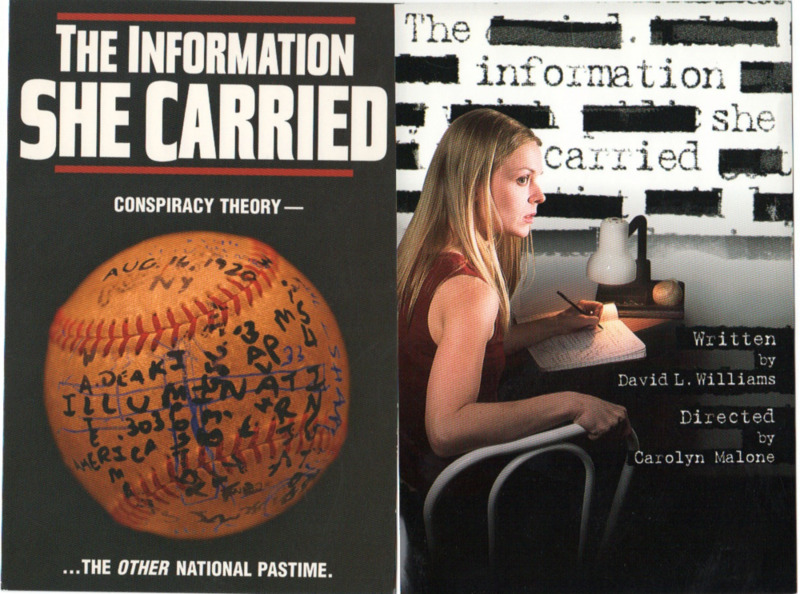 In NYC productions, postcards are a big deal, and two of my favorites have been for two different productions of my play, "The information She Carried." They were both photographed and designed by the very talented Dan Levine (please check out his work by clicking on his name) who always finds a way to listen to my request and make it better. The one on the left was for the NYC Fringe Festival and it focusses on the baseball and conspiracy theory aspects of the play, while the one on the right, which was for an independent production, directs you to the woman in trouble (the lovely and talented Breanna Pine) in the play and the information she's seeking (much of which is not available, as shown by the redacted words above her). They both, by the way, feature a baseball that was given to me by Pirates pitcher Rick Rhoden at a baseball game in the early '80s (we superimposed the crazy writing for the postcard on the left; my baseball remains un-scrawled-upon). Choosing an image to represent an entire production can be a tough slog, but I love both of these postcards and was happy to have them as the calling cards for my work.